The Chicago Bulls have claimed guard Tyler Ulis off waivers to bring their roster to 17 total players. In a subsequent transaction, the Bulls exercised the Two-Way player conversion option on Ulis. In accordance with team policy, terms of the contract were not announced. Ulis (5-10, 150) was waived by the Golden State Warriors on Oct. 12, 2018. He appeared in four games (one start) for Golden State this preseason and averaged 3.0 points, 1.5 rebounds and 1.5 assists in 10.2 minutes per game. Originally selected by Phoenix with the 34th overall pick in the 2016 NBA Draft, Ulis played for the Suns for two seasons. He has averaged 7.6 points, 1.7 rebounds and 4.1 assists through 132 games (58 starts) in his NBA career. Ulis was named Rookie of the Month in April of 2017. The Chicago native played for Kentucky for two seasons (2014-16) and posted career averages of 11.3 points, 2.4 rebounds and 5.3 assists in 30.1 minutes over 72 games. While in high school, Ulis was a two-time Illinois All-State selection and Southtown Star Player of the Year. He ended his career at Marian Catholic High School as the all-time leading scorer (2,335), leader in assists (578) and leader in steals (283). 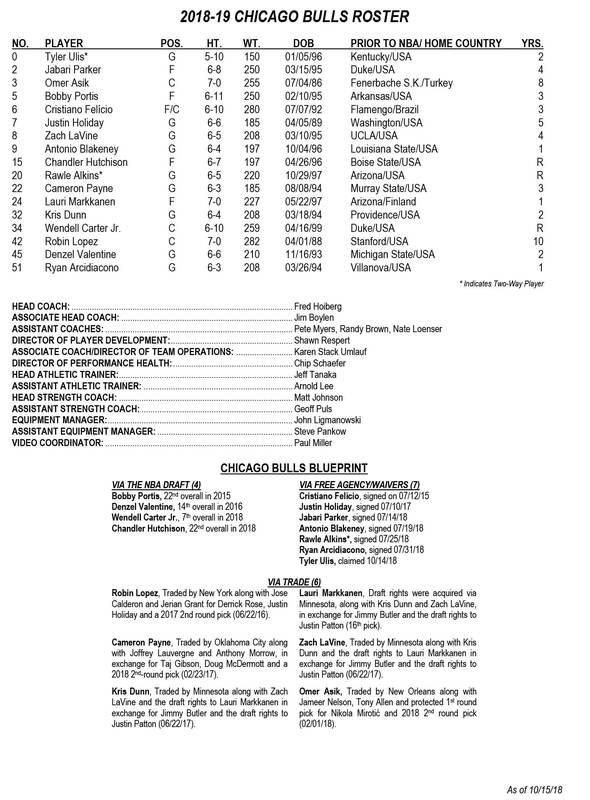 An updated 2018-19 roster is below. How is Tyler Ulis looking to make an impact for the Windy City Bulls?